Scientists and nutritionists alike are still learning about the various benefits of kefir. The beverage, a dairy drink made by fermenting kefir grains with milk or a non dairy drink made with water, has a slightly sour taste and is a rich mix of yeasts, probiotics, and other active bacteria and cultures. It may be a useful addition to the vegetarian and vegan diet. Manufacturers of kefir and consumers have believed in the benefits of kefir for a long time. These benefits are so promising that kefir has gone from an obscure beverage sold only in health-food stores to a mainstream drink now sold in many large grocery stores. Studies remain inconclusive about whether kefir actually has the power to fulfill some of its claims, such as being able to stave off diseases or significantly slow down the growth of cancer cells. More testing is needed to substantiate these claims. 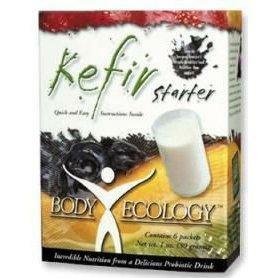 Preliminary evidence does support the hypothesis that drinking kefir regularly is beneficial to the body in many ways. Kefir, along with yogurt, cottage cheese, milk, cheese, and other dairy products, is a significant source of protein for vegetarians and may be appropriate for those who are lactose-intolerant. Because kefir has been fermented, the bacteria and active cultures in the beverage feed on much of its lactose during that process, making it easier for the body to break down and digest the remaining lactose. Kefir contains beneficial probiotics, bacteria that thrive in the stomach and help the digestive system run smoothly. Research suggests that probiotics can prevent or even treat a host of maladies, such as irritable bowel syndrome, yeast infections, and Crohn's disease. Because kefir is made from grain instead of typical probiotics made from dairy products, it's suitable for vegans. There are many benefits of kefir. Although few have been subjected to rigorous scientific studies, less rigorous studies indicate positive benefits. Most of these studies are conducted over a period of several weeks. To obtain similar benefits, you may wish to drink kefir for the same period of time. Enhances the immune system and aids the body in fighting off diseases. Helps eliminate halitosis or bad breath. Reduces the risk of eczema in children and young people. Promotes probiotic products healthy bowels, reduces the risk of flatulence, and generally improves all functions of the digestive system. Relieves symptoms of anxiety or helps treat patients who are suffering from sleep disorders, ADHD, or even depression. It's easy to incorporate kefir into your daily diet if you'd like to begin enjoying some of its many reported health benefits. Before you try making your own kefir at home, purchase ready-made kefir such as Lifeway from a grocery store or health-food market. Experiment with different varieties. If you don't like the pure, unsweetened version of the drink, you might like a bottle that is flavored with fruit or sweetened with cane juice. Try making your own kefir by using a starter to create kefir grains that can be blended with milk or water and fermented. Use kefir instead of milk or yogurt with breakfast cereal and fresh fruit. Blend kefir into smoothies with crushed ice, fresh fruit, and some sugar or honey. Have a small kefir shake or smoothie as a snack between meals.